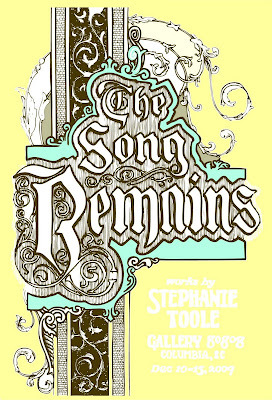 Gallery 80808/Vista Studios welcomes a solo exhibition by Stephanie Toole called The Song Remains the Same – A Study of the Music Memory Connection. 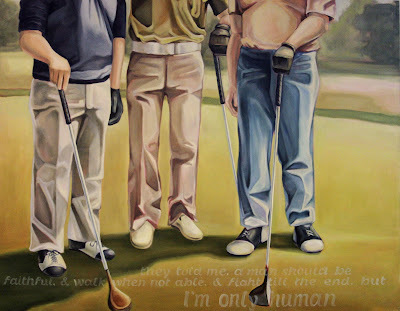 Drawings and painting will be presented at Gallery 80808/Vista Studios, 808 Lady Street, from December 10th – 15th, 2009. The artist’s reception is scheduled on Saturday, December 12 from 6 – 9. 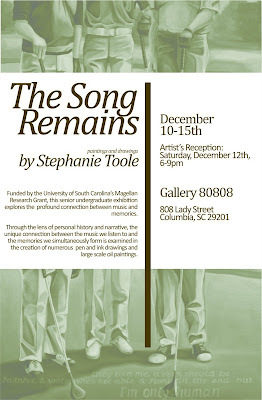 Funded by the University of South Carolina’s Magellan Research Grant, this senior undergraduate exhibition explores the profound connection between music and memories. Through the lens of personal history and narrative, the unique connection between the music we listen to and the memories we simultaneously form is examined in the creation of numerous pen and ink drawing and large scale oil paintings. Above: Invitation front and reverse. Click on either image to enlarge. For additional information, please visit the Gallery 80808/Vista Studios’ website or call the gallery directly at (803) 252-6134. Below is Will You Be There, 64″ x 78″. Click on image to enlarge.